Project Size: 36,300 sq. 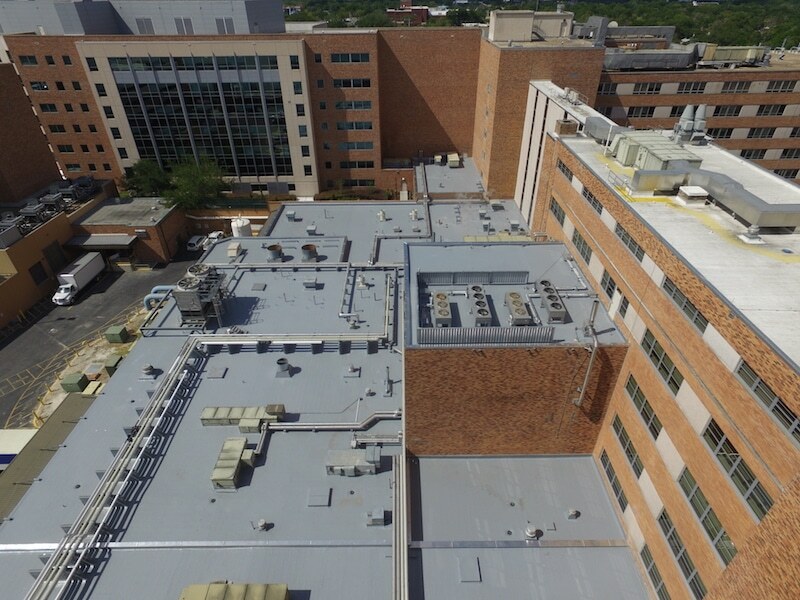 ft.
Lakeland Regional Medical Center benefits from no interference to their operations during a large-scale roofing replacement project. 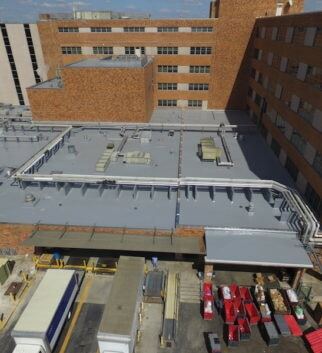 This hospital project was not only a crucial project in the community but one that presented significant challenges. 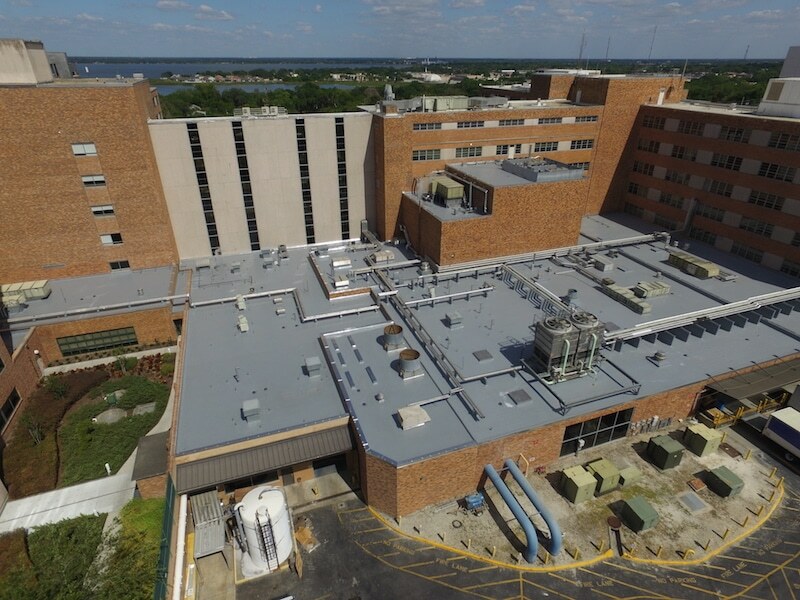 Springer-Peterson’s experience and prior record of success with Lakeland Regional Medical Center solidified us as a great partner to bring to the table. The manufacturer, Tremco, also chose to invite us to bid on this high-profile project. As a preferred contractor with Tremco, Springer-Peterson’s decades of experience and knowledge is just what was needed to bring the vision to fruition. 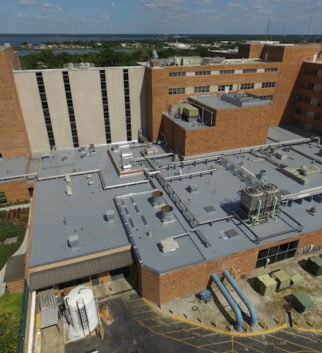 A hospital cannot allow for any water intrusion whatsoever so when Lakeland Regional Medical Center noticed multiple leaks, they were quick to respond. It was determined that this aged Built-Up gravel roof needed to be replaced. It is a 36,000 sq. ft. roof that is not only quite large but one that had significant accessibility issues. This made it problematic in terms of managing a roof replacement. The one and only access point happened to be a very busy loading dock area of the hospital. 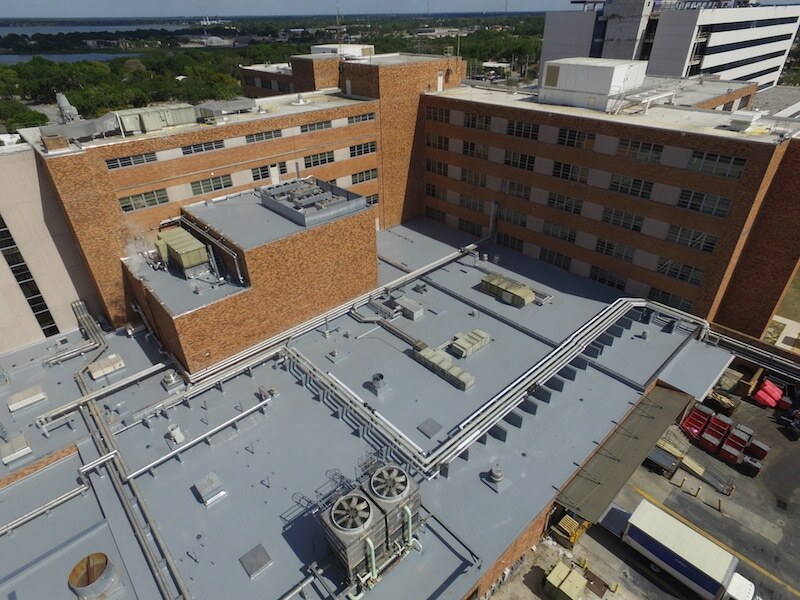 Another issue that needed to be addressed was that they have a lot of foot traffic on the roof so Lakeland Regional Medical Center really needed a roofing option that would be more durable and hold up better than their existing one. 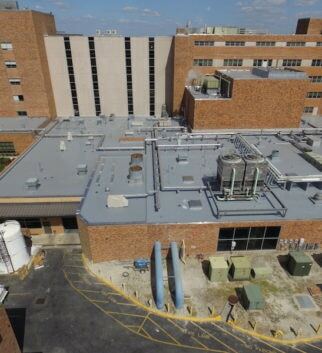 Lakeland Regional Medical Center was seeking an ideal roofing solution but also a roofing installation with no interference to their operations keeping safety as the #1 priority. 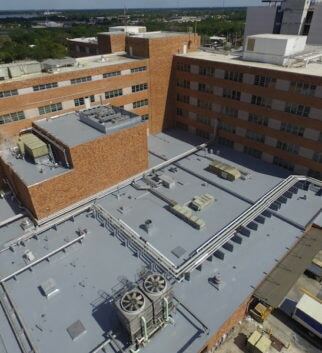 The overall solution was to install a Modified Bitumen Tremco Roofing System. 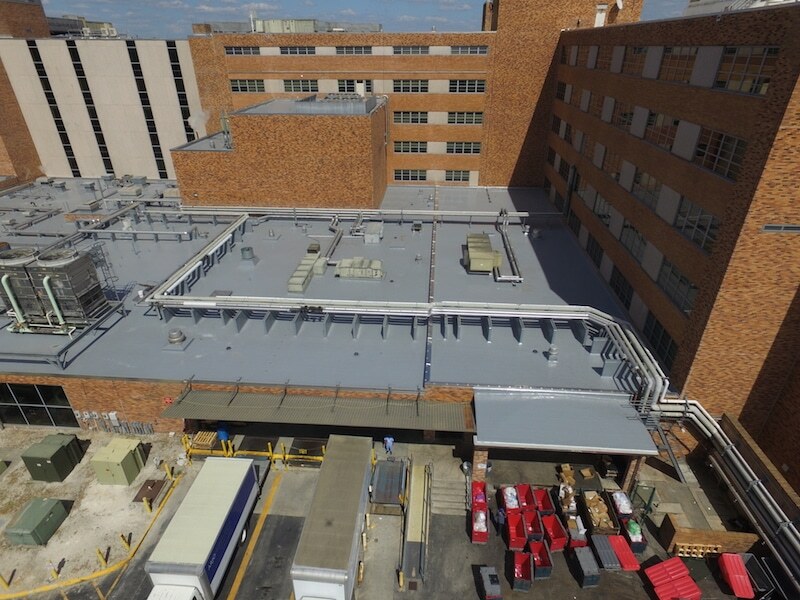 This was a cold-process roof, meaning that all materials were installed using cold-adhesive. The project began with removing the existing roofing system down to the deck. One goal was to facilitate getting the water off of the building to the drains to avoid ponding. All drains were replaced with new ones. In solving the accessibility issue, Springer-Peterson built ramps to move materials back and forth so to not affect daily operations. To provide durability with the constant foot traffic, a smooth surface versus gravel was selected. 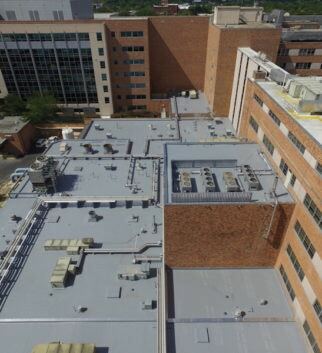 As a result, the roof was surfaced using Tremco AlphaGuard coating. 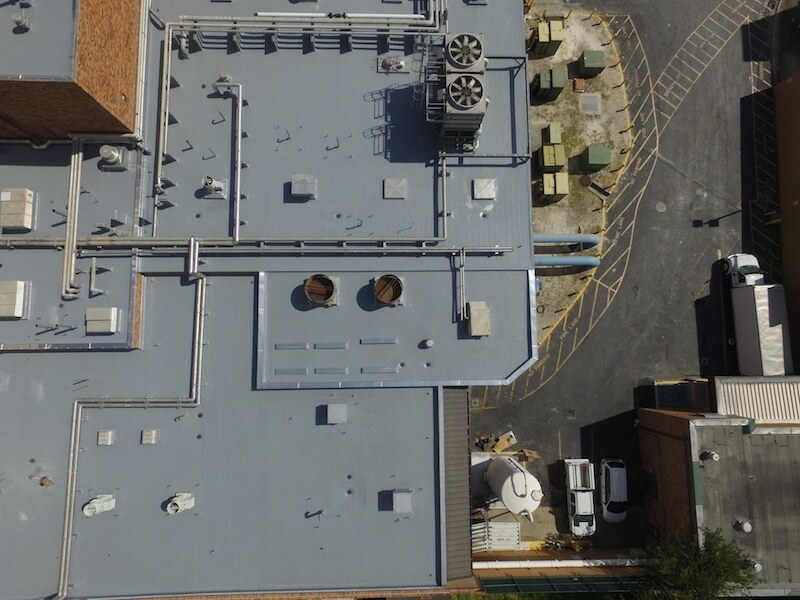 In addition, Springer-Peterson installed a new, tapered insulation system adding value to their roof with the typical resulting lower heating and A/C costs. 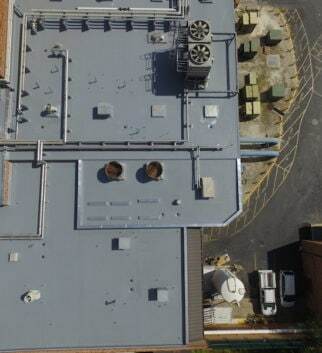 On this project, full-time inspections were done by a Registered Roof Observer (RRO), which is a registered inspector in the industry who has specialized training and verification to observe the roof being installed. Not only were there no interruptions to daily operations on this project but also no water intrusion. There were no injuries due to accidents from water intrusion which met the safety goal. 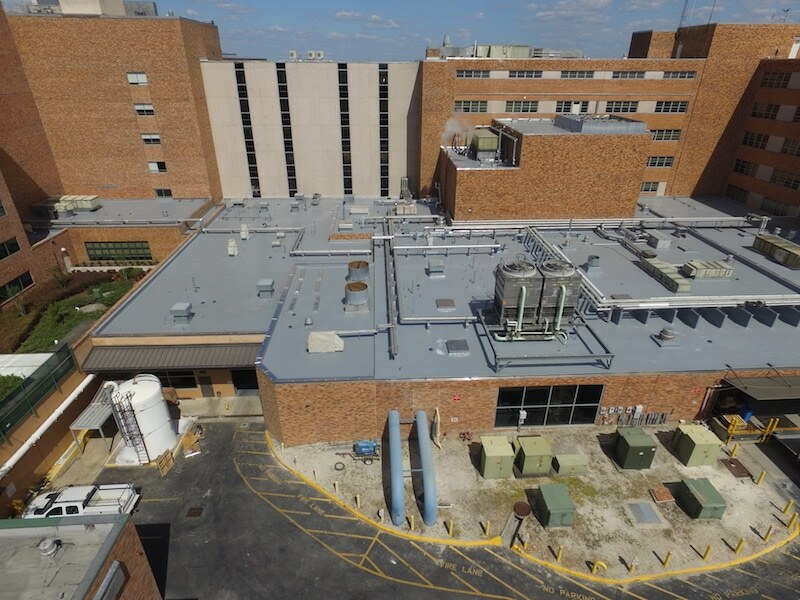 Lakeland Regional Medical Center was happy with the finished project and the process along the way, exceeding their expectations.